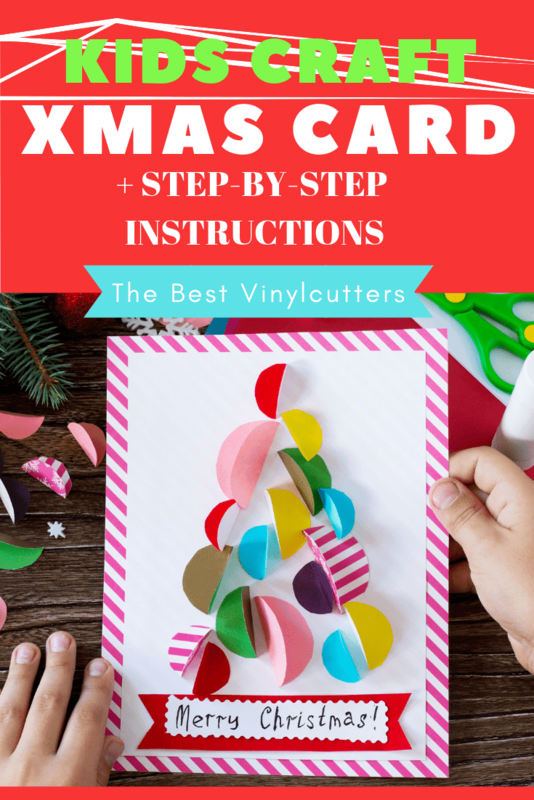 Looking for really fun and easy Christmas card to make with your kid/s? 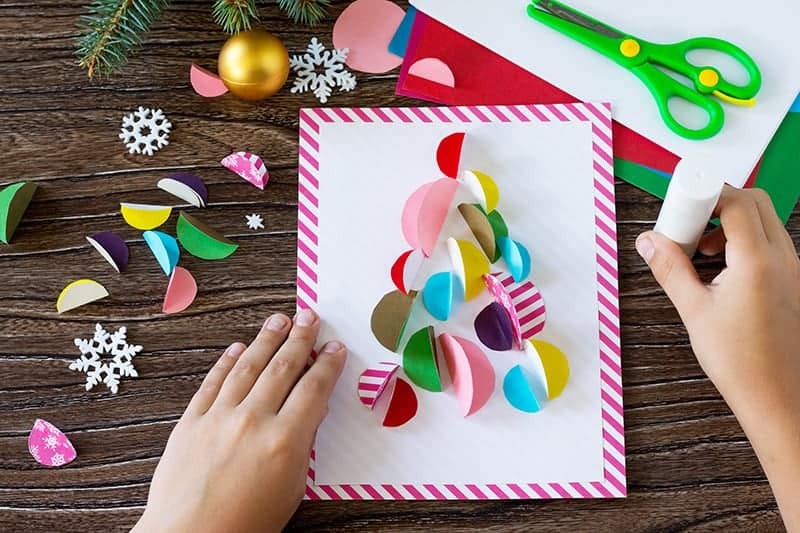 Our DIY Christmas Card Craft for kids is perfectly geared for children aged 8+. You will be able to enjoy this project with kids of younger age, however, I would expect that you would need to be more hands-on with helping out during each step. 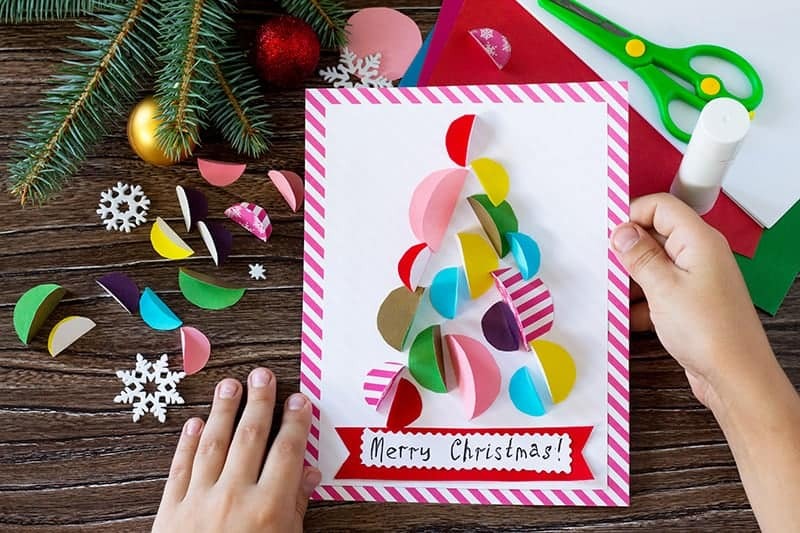 You can find the full step-by-step tutorial on how to create this gorgeous Christmas card below. 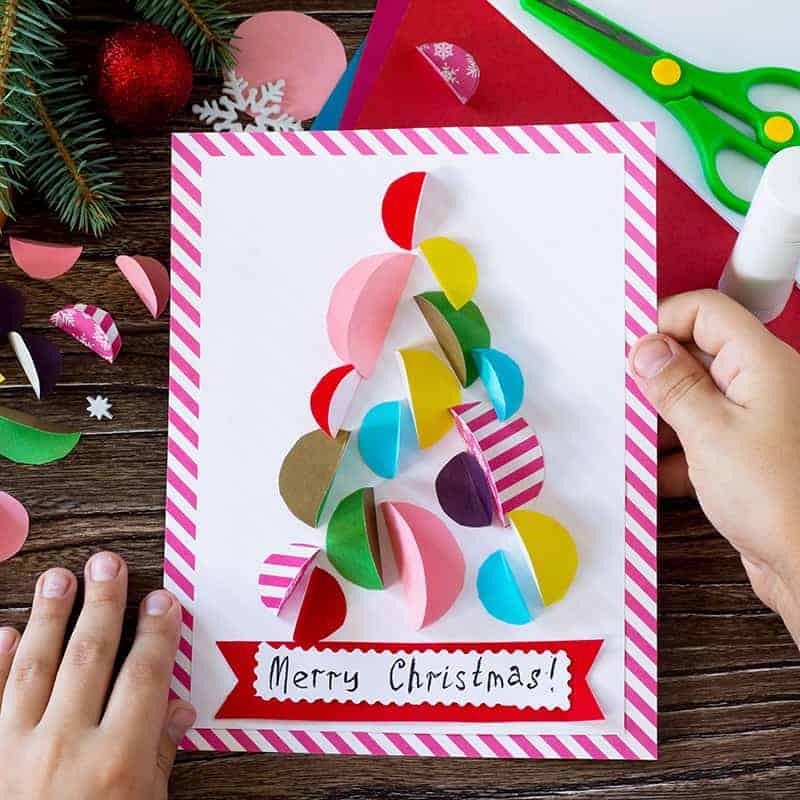 Find below the supply list as well as the step-by-step tutorial to show you how you can create this easy and beautiful Christmas card. Here are a few ways in which you can easily create some circles for the card. 1. Use Circle Punches. Kids love using punches, so you can easily leave your child to punch out some circles to their heart’s content. You can even buy circle punches in sets of 3 to get the different size circles that you are after. 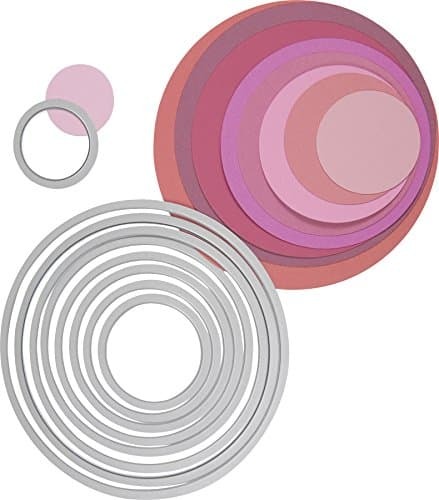 Here are some great circle punches on Amazon. 2. 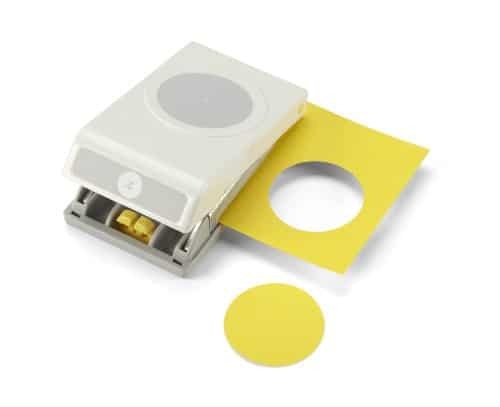 Use a manual or electronic die cutting machine and some circle dies. Manual die cutting machines are pretty cheap. You can pick up a Cricut Cuttlebug Die Cutter for under $100. 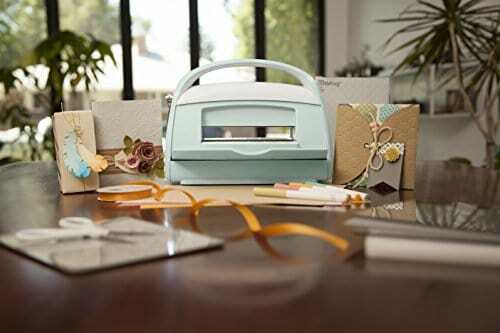 (Read our review about the Cricut Cuttlebug Machine here). Grab your Cuttlebug from Cricut.com here. Grab a circle dies from Amazon here. My kids LOVE LOVE LOVE cranking the handle of a manual die cutter to cut out circles. This is my preferred way of doing it as you can cut multiple layers at once. If you do a lot of crafts with your kids, these machines are gold! 3. You can create some chipboard circles (as templates) from lids or round objects from around the home. Your child can trace around these and then cut out the circles this way. Seems painful to me and will take forever – not to mention your child might get bored with it. But it is a cheap way to do it. Step 1: Grab your patterned piece of paper and trim it down to an A4 size. If you have a trimmer, trim it to 12″ x 8.5″. If you don’t have a trimmer, give your child an A4 sheet of cardstock. They can use a pencil and trace around this and then cut out the patterned paper along the pencil lines. Fold this sheet in 1/2 to make a card. 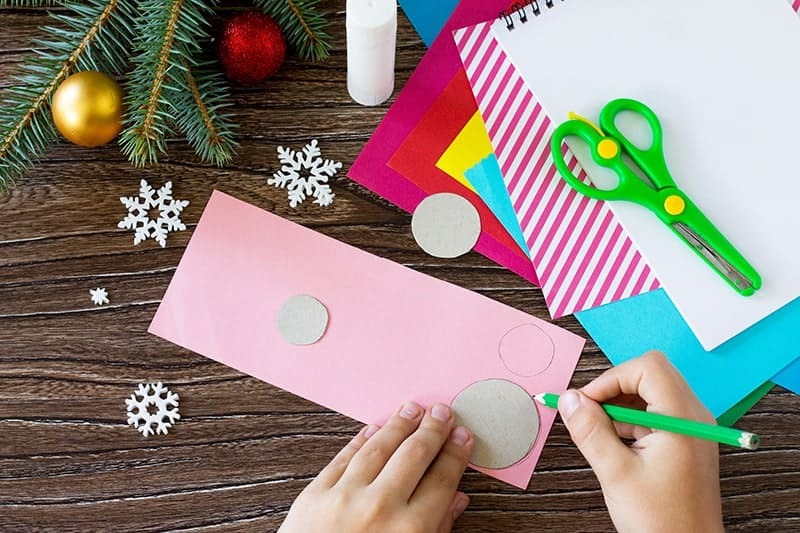 Set aside the rest of the patterned paper so you can use it to make circles for the tree. Step 2: Trim down your white cardstock to around 5″ x 7.5″. Glue this piece down in the center on the front of your card. Step 3: Create around 20 circles in different sizes and from a range of colors. We love to mix up solid colors with some double-sided patterned paper. Step 4: Fold each of these circles in half. Step 5: Pop glue on one-half of the circles and glue these down in a triangle/tree shape on the patterned paper. Tip: If your child is younger, you might wish to lightly draw a triangle shape on the cardstock so that your child can work inside the space. Step 7: With a pencil draw a rectangle on your white paper that measures 3.5″ x 1″. Use some decorative edge scissors to cut around the edge of this border. Glue this down on top of the red banner you created in the previous step. Step 8: Neatly write your Christmas message such as ‘Merry Christmas’ to finish off your card. 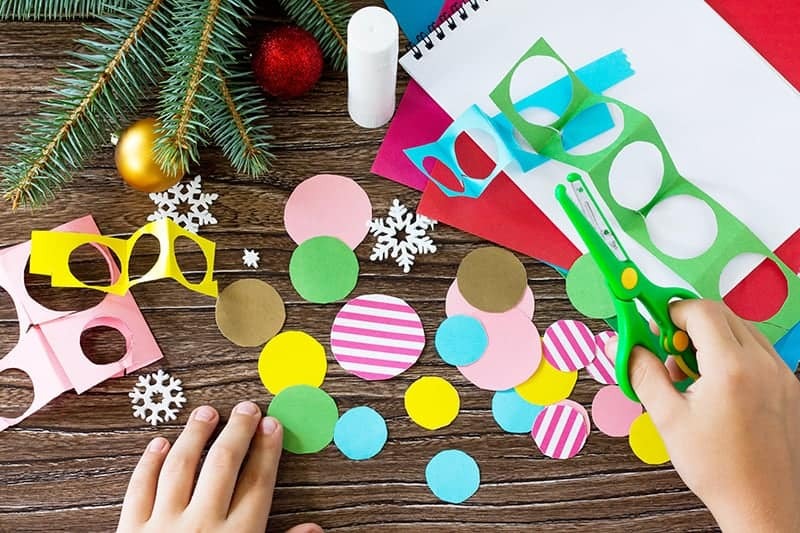 If your child is younger, you can always pre-cut all the elements for them so that they only have the task of folding and gluing down all the elements. 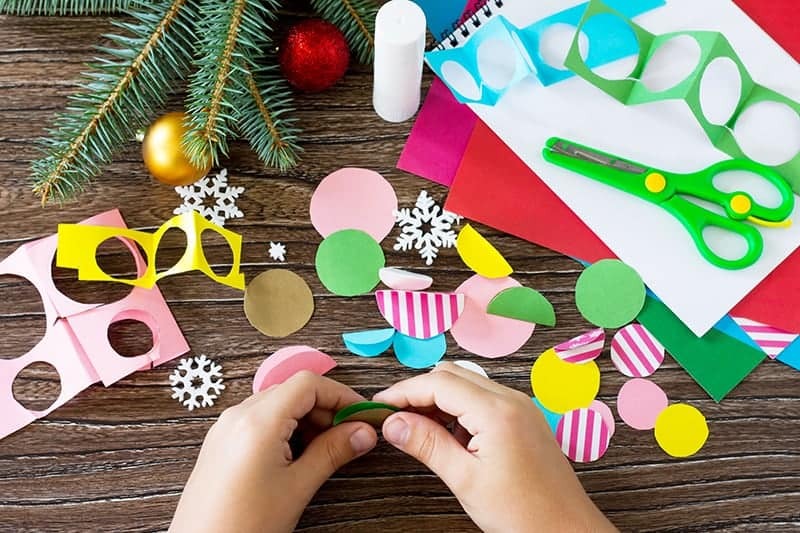 We hope you had fun spending some quality craft moments with your child. Now the challenge is to go and whip out a few more of these cards so that there are enough for all the family members.